Spherical Plain Bearing COM.T Series is a component that fixes and reduces the coefficient of friction of the load during mechanical transmission. It can also be said that when other parts move relative to each other on the shaft, the mechanism for reducing the coefficient of friction during power transmission and maintaining the center position of the shaft is fixed. Spherical Plain Bearing COM.T Series is a component that fixes and reduces the coefficient of friction of the load during mechanical transmission. It can also be said that when other parts move relative to each other on the shaft, the mechanism for reducing the coefficient of friction during power transmission and maintaining the center position of the shaft is fixed. Spherical Plain Bearing COM.T Series is a pivotal component in contemporary machinery. Its main function is to support the mechanical rotating body to reduce the mechanical load friction coefficient of the equipment during the transmission process. 2) Materials: Outer race is made of carbon steel, inner race is made of high chrome bearing steel. 3) Heat treatment: Without heat treatment on outer race. Inner race is quenched (hardened), and surface plated with chrome. 4) Features of structure: Without oil groove or oil hole. Outer race formed by extrusion. With a PTFE fabric between outer race and inner race. 5) Properties: Self-lubricated, low friction good wearability, self-alignment. 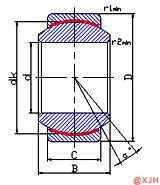 Spherical Plain Bearing COM.T Series should be installed so that the centerline of the joint bearing bore and the shaft coincide. The skew of the joint bearing relative to the shaft not only causes installation difficulties, but also causes indentation, journal bending and even breakage of the inner ring of the joint bearing. Spherical Plain Bearing COM.T Series Load size and load direction Where the press is missing or cannot be used, the joint bearing can be mounted with the assembly sleeve and the small hammer. The hammering force should be evenly transmitted to the entire circumference of the end face of the joint bearing ring, so that the hammered end face of the assembly casing should be made spherical.